This post is part of our Language & Literacy Development blog series. Stay tuned for more! Today’s post is for our early-education readers, especially inclusive educators looking for simple strategies that help students with disabilities improve their language skills. Excerpted and adapted from Early Literacy in Action by Betty H. Bunce, this detailed example introduces you to Tom, a preschooler with language delays. You’ll see how Tom’s teacher used simple prompts and modeling strategies to help him reach his language goals–and support better outcomes for Tom and his peers throughout the school day. Three-year-old Tom speaks primarily in one-word utterances. Tom’s words are usually intelligible, and he appears to understand much of what is said to him. He’s shy when interacting with peers, preferring to watch rather than play with them. He usually pays attention to the teacher during group activities and responds nonverbally to adult directions. To help Tom increase vocabulary knowledge, length and complexity of utterances, and appropriate peer interactions, here are some examples of interventions his teacher implemented in the classroom during the day. These included both general language facilitation techniques as well as specific intervention techniques. Paraprofessionals and support professionals can model these techniques, too. Encourages expansion: When Tom says, “Block,” the teacher says, “Big block,” “Two blocks,” “More blocks,” or “Blocks in tub,” depending on his meaning. Selects books that label objects, as a way to present new vocabulary. Chooses stories with repetitive lines to teach language structure, help children predict future events, and encourage them to join in. Teacher: Teddy bear, teddy bear, what do you see? I see Tom looking at me. Sharing time teaches children new vocabulary words and helps them learn how to ask and answer questions. As a child shows the class something brought from home, Tom’s teacher prompts another child to ask three routine questions about the item (“What do you have?” “What do you do with it?” and “Where did you get it?”). The teacher encourages Tom to participate in asking questions and initiating interactions with his peers. Pays special attention to teaching Tom new vocabulary words and grammatical forms (e.g., hand in the mitten). Teaches a variety of verbs (e.g., run, jump, skip, ride, slide, dig, climb, build) and prepositions (e.g., in, through, on, down, under, on top of, in front of, behind). Prompts peer initiations: When Tom wants a turn on the bike, his teacher says, “Tell Joe, “˜My turn, please,'” to help him negotiate. Prompts peer initiations. When Tom indicates he wants more juice, his teacher says, “Why don’t you ask Suzie to pass the juice.” She models “Suzie, please pass the juice” if Tom declines to ask. Lets children sit by their special friends to encourage them to talk to each other. Targets Tom’s vocabulary goals. In Tom’s case, his targeted vocabulary includes the location term “in.” So Tom’s teacher asks him to identify the item that’s in the box (versus beside or under the box). Models appropriate vocabulary and structure. Prompts and expands initiations and responses from Tom and his peers. Asks open questions to help all children learn to problem-solve or to focus on a specific feature. For example, the teacher asks, “How can we find out how many ribs Smiley the Skeleton has?” One child responds by saying, “Count them.” The teacher has the child help count the ribs. Picks songs that are short and repetitive so all children can easily learn them. Has Tom start out by imitating the different animal sounds as the class learns “Old MacDonald Had a Farm.” He’ll work his way up to singing the whole song with the class. 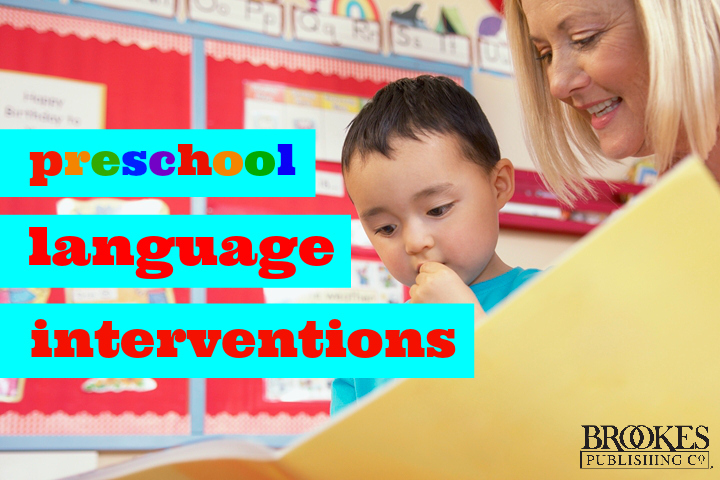 These simple strategies and techniques illustrate how children with speech and language impairments can receive interventions within a day of typical preschool activities. When teachers provide a language-rich environment with many opportunities for both child”“child and adult”“child talk, children like Tom can make progress toward their goals–and all learners will benefit, too!